Dice the onion and pepper in medium sized dices and place in a prep bowl. Peel and finely slice the ginger, and finely chop the spring onion, placing each into separate small prep bowls. Mix ‘The Sauce’ together in a small bowl or ramekin. 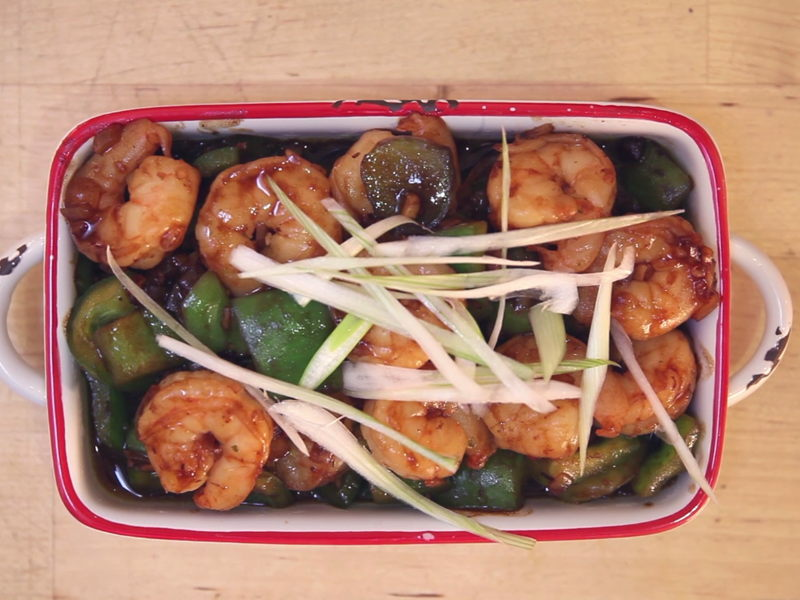 Build your wok clock as follows; first your onions and peppers at 12’o’clock, followed by the ginger, prawns, sauce, and finally spring onions to garnish. Heat ½ Tbsp. vegetable oil in a wok to high heat. Once smoking hot, add the diced onion and pepper then turn the heat down to medium. Stir fry the onions and peppers for one minute until slightly soft, then push the vegetables to the back or side of the wok and turn the heat back up to high. Add 1 Tbsp. oil to the middle of the wok until smoking hot. Add the ginger and stir fry for 30 seconds before adding 1 Tbsp. more oil into the wok. Once smoking hot again add your prawns and stir fry for 2 minutes until pink or coral in colour. Now add ‘the sauce’ mixture and cook for one more minute on high heat before removing and tipping into a serving bowl. Sprinkle with finely sliced spring onion to garnish and serve.